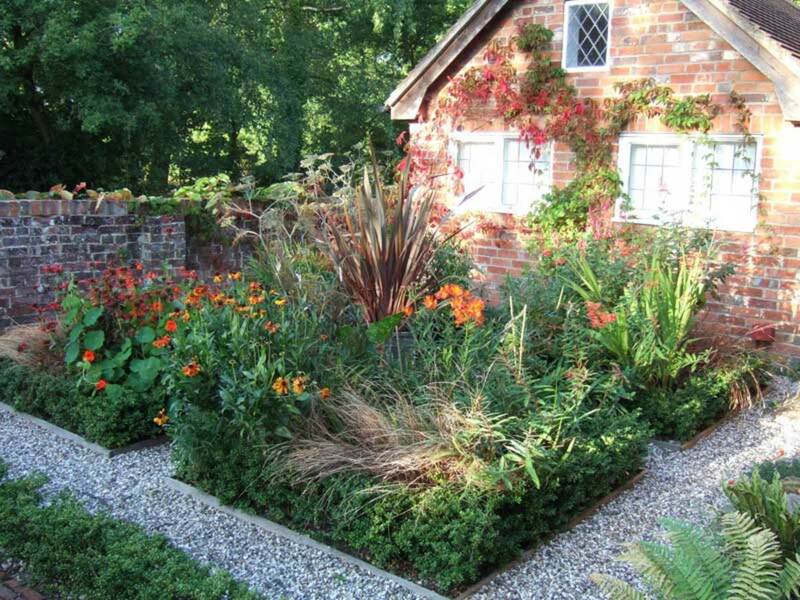 A staple of English Arts & Crafts gardens, edging has practical as well as historical appeal. 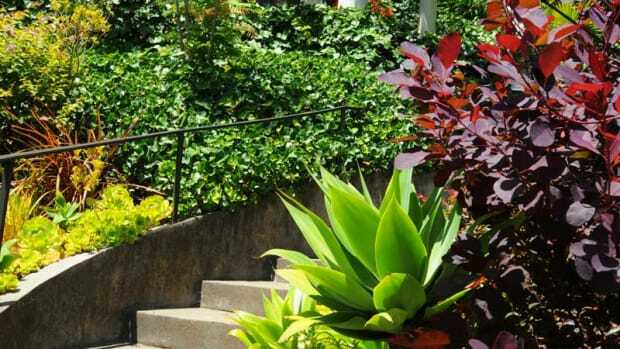 From buried barriers to iron and stone, garden edging remains a practical and often ornamental staple in the garden. A flagstone patio becomes a wide border of stones and step-able ground cover between planting beds. Edging prevents soil and mulch from overflowing flower beds, and helps keep loose gravel or mulch within their borders for crisp and clearly defined walkways. 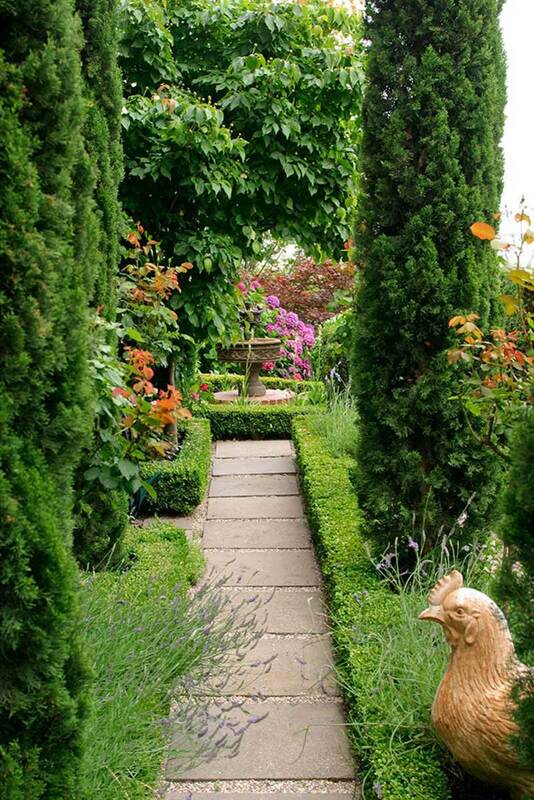 Using taller borders of miniature boxwood or low fencing directs traffic and keeps visitors (including wayward children and dogs) on the paths and out of the flowers. 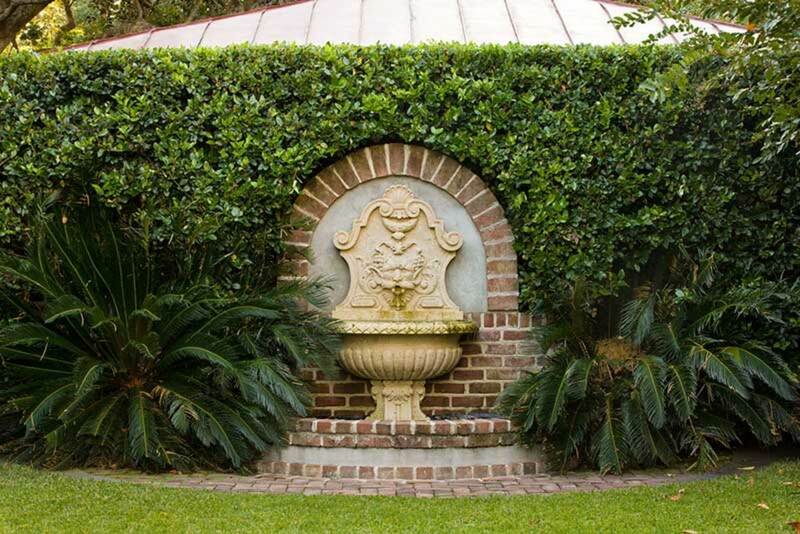 In Charleston, a brick border between lawn and hedge makes mowing easier—no whacker needed. Installing tile, brick, or stone edging is not complicated (but you will need a strong back). Be sure to check with the local utilities for underground lines before any digging. 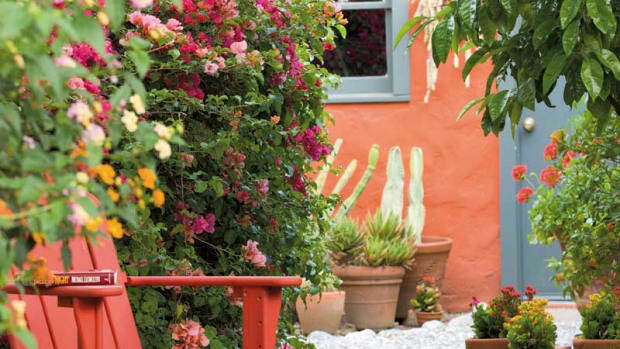 Start by outlining the area; a garden hose works well if the border is curved, or use a tight string for straight lines. Lightly outline the final edge with spray paint. Next, dig a trench four to six inches wide and three to four inches deep, using a square spade for cleanly cut lines. Fill the bottom of the trench with an inch of sand to stabilize the edging and prevent grass roots from invading the beds; pack it down well and spray it lightly with water to help it settle. 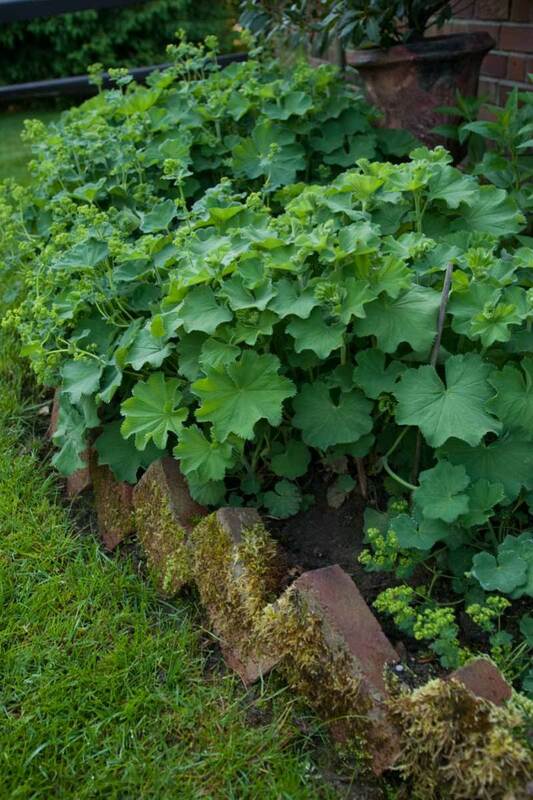 A soldier course of mossy bricks buried on a diagonal separates the lawn from the lady’s mantle in a New York State garden. Then set the bricks or tiles, making sure they protrude at least two inches above the soil, especially if the bed is heavily mulched. Tap any loose pieces lightly into place with a wooden mallet and fill with more sand, gravel, or mulch, packing in very snugly. For a long-lasting, unmoving border, use L-shaped paver edging held with long spikes, like those by Edge-Tite. 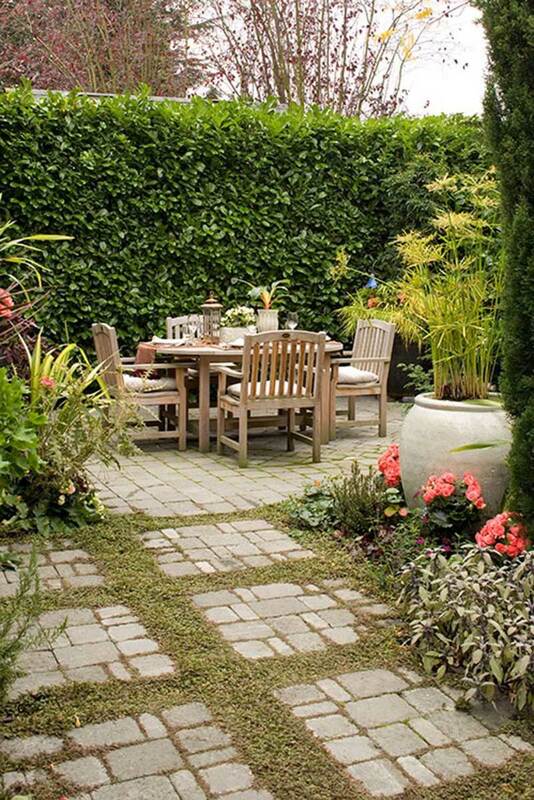 A double border—miniature boxwood hedges and flagstones in gravel—is also a path. To edge between lawn and mulched beds, whether for a flower border or around trees, a buried metal edging works well if it’s properly installed. Typically steel, the edging comes in 4" x 10&apos;-long strips. It’s easy to bend around curves and hills, but it’s heavy (about 225 lbs./100 ft.) and steel can rust. Coated aluminum provides a similar look but is lighter (41 lbs./100 ft.) and easier to work with, and it doesn’t corrode. Plastic edging is available as well, but not as historically sympathetic and looks terrible if it heaves upward. These edgings generally protrude about a half inch and can be mowed over. But metal is sharp, a consideration. Other materials can be used for edging, of course. New England Garden Ornaments shows a partially buried antique iron wagon wheel to define the wedges of an herb garden! If you use a raised edging—cast iron, cobblestone, brick soldiers—consider trip hazards and always leave an obvious path through or around it. 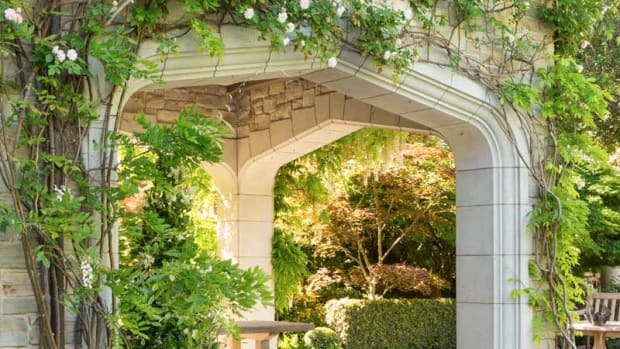 For a wider division between lawn and beds, or lawn and a stone wall or fence, consider a swath of gravel or a wider border of paving stones or tiles. Pavers are laid in a bed of sand and require minimal maintenance. A wider swath sets off garden structures such as fountains or terraces, and sharpens the overall layout and design of the garden. And that nice, flat edge makes mowing and trimming the lawn much easier. 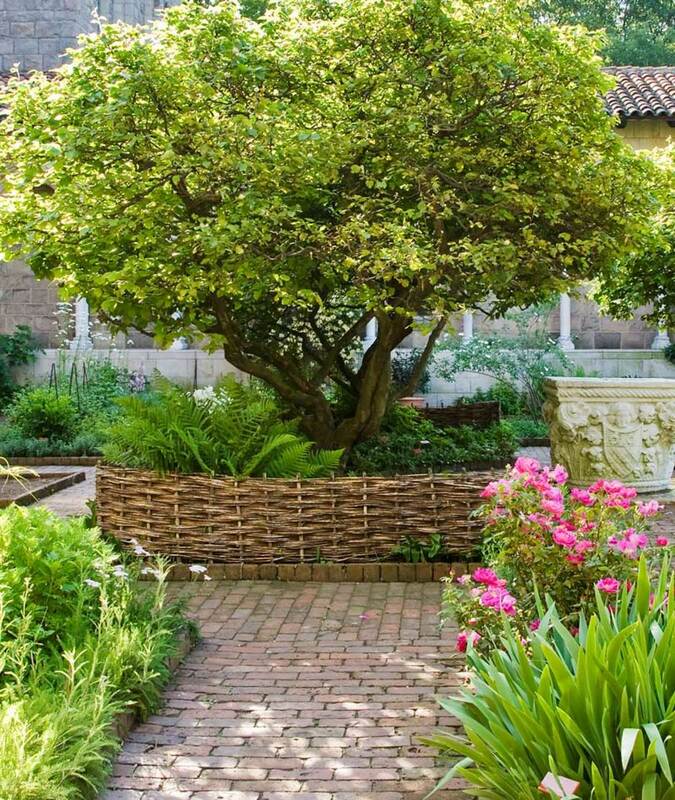 Wattle edging is featured in the medieval garden at Manhattan’s Cloisters museum. BRICK Pavers or hard-fired bricks look good and last in almost any traditional garden. Brick collects moss in damp areas and may become slippery. 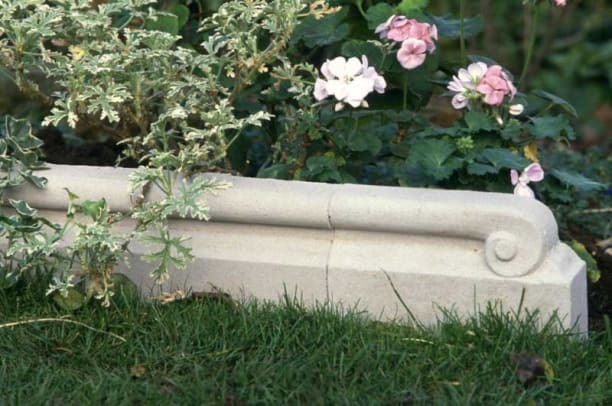 CAST IRON ornamental edging is authentic; depending on height, it can be a low border or a short fence. The oxidized finish is fairly stable. CONCRETE Extremely durable concrete can be made in nearly any color and poured into just about any design you want. You can also use pre-cast concrete bricks, “stones,” and tiles. It’s very hard to remove poured concrete edging if you later change your garden’s design or layout. METAL It’s not obtrusive and it’s easy to bend and curve, but metal edging is hard to handle, and it rusts. PLASTIC Affordable, flexible, and easy to install, plastic edging is not historical. It should be buried well and is best for long runs and curves, especially in the back of the garden (not up close). STONE One of the more versatile edging materials (both natural shape and tooled, as in cobbles), stone can be carefully set in mortar or artistically combined with pebbles or gravel and other materials for a custom look. TILE English rope-edged tiles are the most historically accurate, but today they are pricey. WATTLE A historical edging in which saplings of pliable wood such as willow are woven into a band; wattle works well for holding back deep mulch. WOOD Affordable and easy to work with (but good only for straight lines), wood adds an informal, organic look. Wood edging will last about 10 years (pressured-treated pine is best, to counter insects and rot). Belvedere Island is situated between Sausalito and Tiburon on San Francisco Bay. This house was built as an open-air retreat in 1912 by Dr. Florence Nightingale Ward, the pioneering physician and close friend of architect Julia Morgan (who may have contributed to its design).